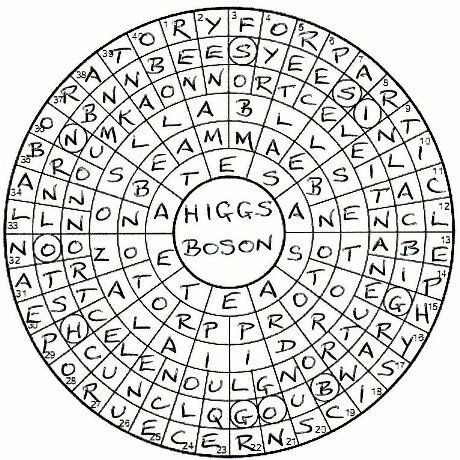 This is Hedge-sparrow’s fourth Listener puzzle; the previous three concerned wormholes (3988 Travel Agents), Darwin’s writings on evolution (4067 S), and Einstein’s theory of relativity (the special variety, 4064 Metrical Variations). If I’d known that Hedge-sparrow was of a scientific bent, it might have helped; but there again, probably not. 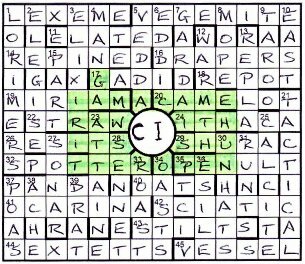 Here we had a circular grid with thematic things to discover in three of the rings and a number of circled cells which result in an end-product. 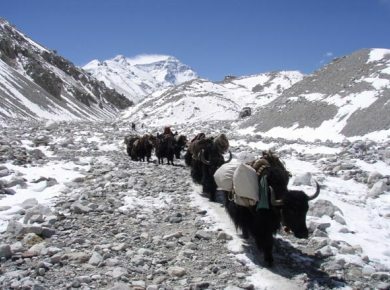 All very interesting, and the usual groups of four radials each contained one entry entered inwards, one outwards, and two jumbled. Just to add spice to the jumbles, one was to a 6-letter word and the other to a 7-letter word with one letter being dropped before entry. While the jumbling of half the clues didn’t necessarily mean a lot of cold solving, it did mean that I abondoned my usual quick first pass through the clues. Instead I found myself concentrating on groups of say 6 or 8 clues and worked my way more slowly round the grid. The clues were an interesting mix of the straightforward and complex. Take 2ac: Broken enamel hiding trace of yellow hydrocarbon which is obviously Y in ENAMEL* giving AMELYNE (although I needed Bradford’s to help with my hydrocarbons). On the other hand, 4 is End of fine maiden over with turning ball around close of play — it’s the start of something. In my opinion, there’s a lot going on here, and it turned out to be E (end of finE) M (maiden over) + ORB< (ie reversed) around Y (close of plaY) to give EMBRYO. I tend to dismiss clues that make my brain hurt until much later in the solving process. So, after about an hour I had 16 clues solved, the last three being 33 LANOLIN, 34 ANNONA and 35 ABSORB. I normally pencil in the entries for this type of puzzle inwards, but since the second B of ABSORB cannot be in the innermost ring I entered it outwards. Looking at the grid after doing a full circuit, I saw LAB in positions 33, 34 and 35, and E..O at 25-28. It seemed obvious to me that I was looking at the European Laboratory for Particle Physics, known as CERN, from it’s original name, Conseil Européen pour la Recherche Nucléaire. 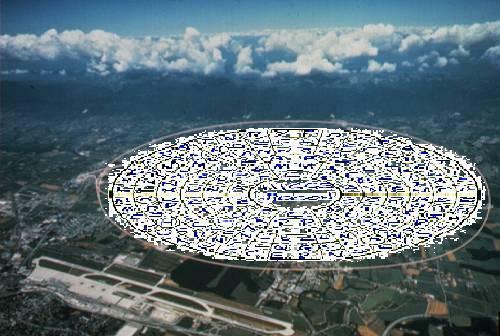 It probably also meant that the LARGE HADRON COLLIDER (LHC) was lurking nearby! With 19 letters it would make up the letters not entered in all but one of the 20 segments of the grid. Voilà! 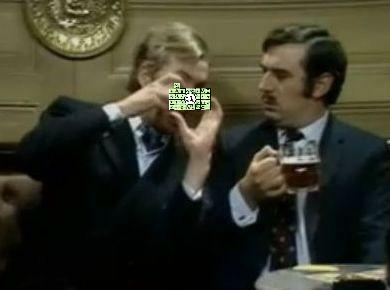 I won’t say that the rest of the puzzle was a doddle, a great deal of care needs to be taken with the Listener. However, I think I completed this one in about 2½ hours, so pretty good on that front, and certainly helped by early identification of the theme. 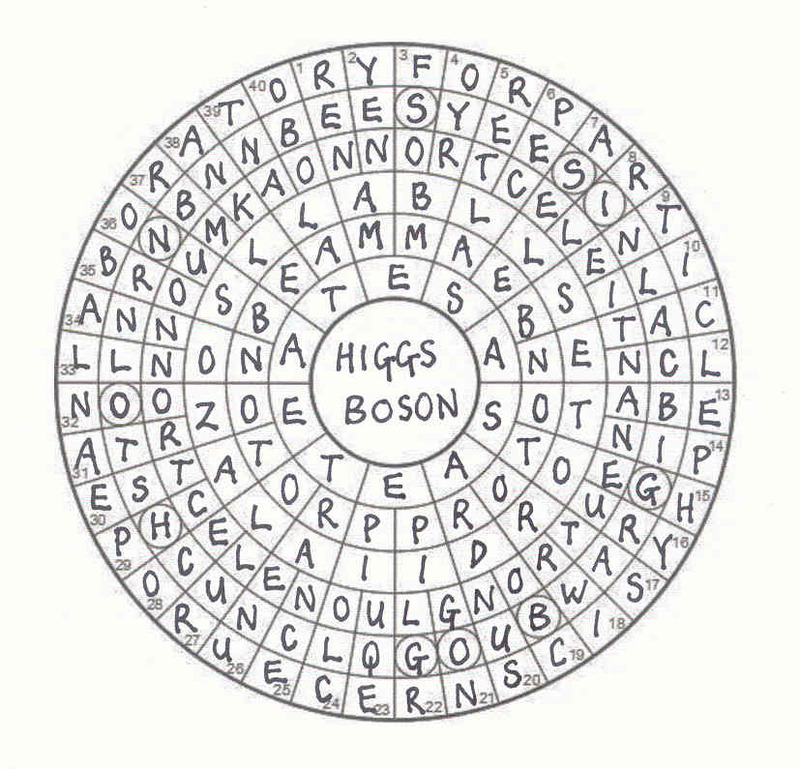 Finally, the circled letters in ring 2 were SSIGBOGHON which could be made into HIGGS BOSON, entered in the central circle. The particle is named after Dr Peter Higgs, an English theoretical physicist, who predicted its exixstence back in the 60’s, I think. A lot of people have been looking for it ever since! A really neat puzzle from Hedge-sparrow with excellent clues, nearly all of which had very good, and often devilishly misleading, surface readings. My favourites were 15, with its reference to the expenses scandal, Government given accommodation failed to declare income (GHOSTED); 33 Fat lecturer takes an old lodger in (but not ‘er dog sadly) (LANOLIN) which just made me smile; and 40’s comment on the greedy power companies Group of utilities about to seize money — not good! (TOOLBAR)! I’m looking forward to the next one from this entertaining setter. 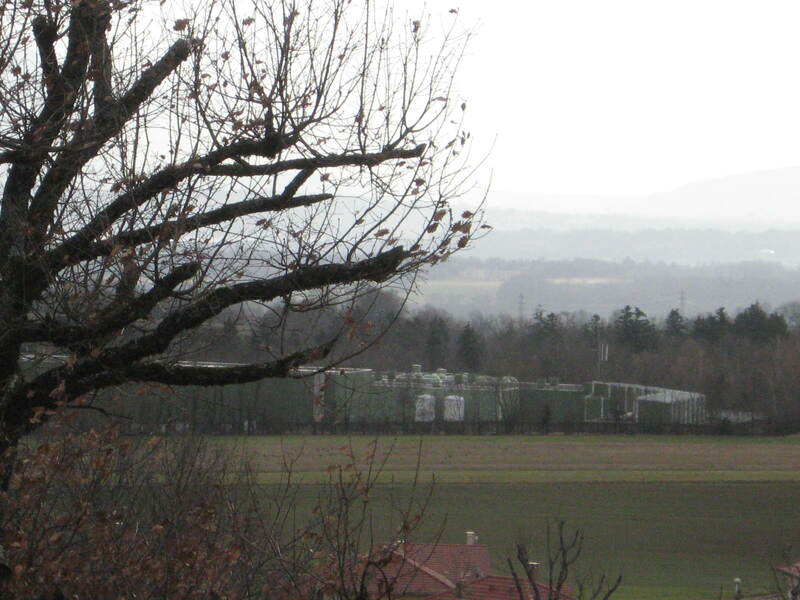 CERN's LEP seen from the front window. Circular! Great, that must be the first circular since the very first Listener puzzle the numpties attempted, Frank’s ‘Rings’, way back in 2008. Then I read the preamble about ‘alternative’ indications, ‘clockwise or anticlockwise’ two entries in each set of four JUMBLED – those ‘all but one’ having an extra letter, and the circled letters being ‘constituents’ of a final product. Perhaps this is a sign from above that it is time to bring the numpty solving career to a close. In despair, I gaze out of the window at CERN’s LHC that half fills the view between the bottom of the garden and Mt Blanc even in this dull weather. I muse about those particles zinging their way clockwise and anti-clockwise three hundred feet down and that elusive Higgs Boson. That’s the boson that is responsible for ‘mass’, according to current particle theory. Production of mass – Mass Production. Wait a minute! Could it be …? That preamble was daunting but the clues are very fair. I’ve heard of setters who work in clue order from 1 across to 40 down but I wonder how many solvers impose that discipline on themselves as an added challenge. RENAME, AMYLENE, BEFOAMS, EMBRYO … It worked for a while, but gentle clues all the way round the rings were appearing and tempting us; ‘Inattentive sailor transported’ (ABSENT ), ‘Pigeon’s poor, poor imitator’ (EPIGON), ‘Land vehicle’ (ESTATE), ‘Edmund’s hooked finger placing explosive around Alabama’ (TALANT). Yes! PROTON BEAM/PROTON BEAM appeared, heading in two directions. This was inspired! We began, appropriately, to hunt for particles and, equally appropriately, found them heading in opposite directions, an ELECTRON heading clockwise and an ANTI-ELECTRON anti-clockwise (that was the way it was in LEP, the previous machine). Sure enough, the GLUON, KAON and MUON were there (and, even in this scientific environment, Hedge-sparrow didn’t disappoint, there was the obligatory oenophile touch to get the GLUON, he ‘knocked back drink containing essence of plum’). CERN has to go around the outside edge and ‘Laboratory’ and ‘Particle Physics’ are already evident, so clearly Hedge-sparrow must be using the name that is commonly given to the Organisation Européenne pour la Recherche Nucléaire (European Organization for Nuclear Research) EUROPEAN LABORATORY FOR PARTICLE PHYSICS. 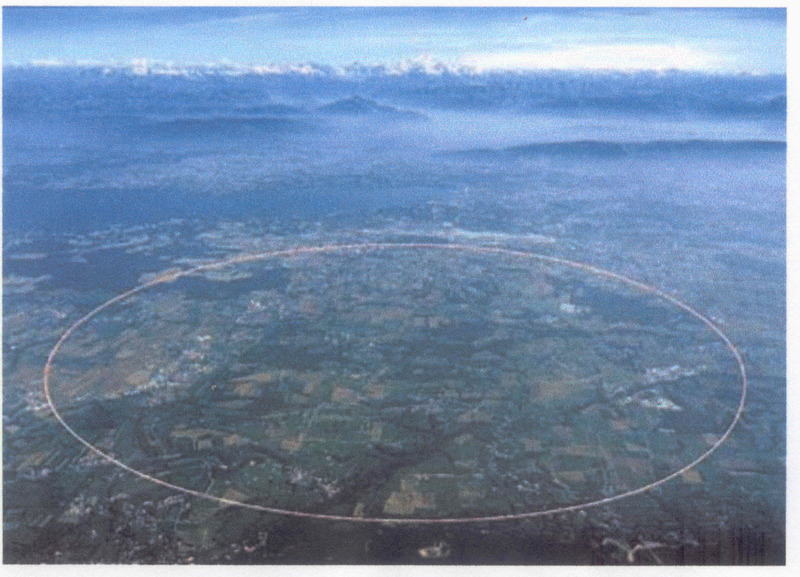 We complete our outer circle and find that four letters are left for CERN, neatly at the bottom. Perhaps that explains the unusual symmetry of the circles where No. 1 is offset at the top. I thought this was a lovely puzzle. Just the encouragement I needed to keep going. Many thanks, Hedge-sparrow. Bang go my New Year resolutions to kick the habit of solving Listener crosswords, to read a good book on Friday evenings and to quit the blog. I down-loaded Loda’s Auf Wiedersehen just to glance … but a couple of delightful clues caught my eye and I was hooked again. ‘Quickly, say to them inside, “Alastrim” – it’s spread all over Oz’ (8) “Whatever could that be?” I asked the assembled company. We were celebrating Hogmanay at the time and the replies reflected the whisky consumption. “Rabbit excrement?” “Kangaroo dung?” “No, alastrim is some kind of disease – STD?” (no, not the telephone network!) and on it went. Of course, ‘Alastrim’ was the extra word giving two necessary As but VEGEMITE was delightful (VITE round EG and ‘EM). Equally captivating as a clue (and mildly appropriate for Hogmanay) was ‘Get dry scrumpy in support group at one’s workplace’. Good to see that Loda upholds the oenophile Listener setter tradition – do they reject a crossword that has no healthy slarting of alcohol in the clues or solutions? What do we have here: TT in AA + IN with ‘scrumpy’ as the extra. It was a steady solve of nicely transparent clues from that point on and the extra words stood out fairly obviously so that we soon had SALLY, NATALIA, OTTO, FRAU NOWAK and FRAULEIN SCHROEDER as well as a ‘man shaving at the window, woman in kimono washing her hair’. All that remained was to move the G of ‘GOODBYE’ into the cell where a clash had appeared (MANIA intersecting with CADI) and to highlight the little camera that had appeared. I suppose the G was intended to represent one of those small square pop-up viewfinders on old-fashioned cameras. Did I say, ‘All that remained’? Those two letters CI had to move into the centre of the lens. “I see” – well, that’s IC cryptically, isn’t it? They had to appear in ‘thematic order’. 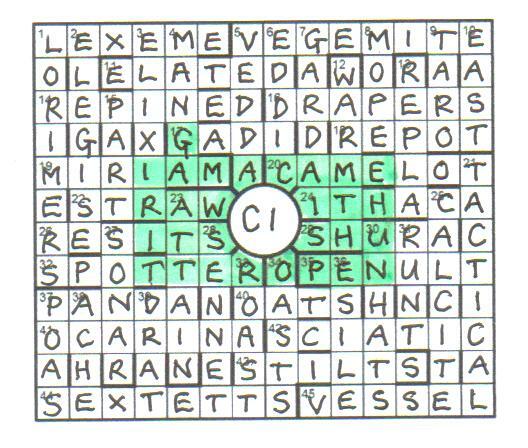 Does that mean the cryptic theme – being a camera with an open shutter, so ‘seeing’ (I see) – or the author illustrated in the crossword, Christopher Isherwood? Dilemma! It seems to me that either solution could be defended – but I opted for Mr Isherwood. Thank you, Loda. A fine, fair start to the year.